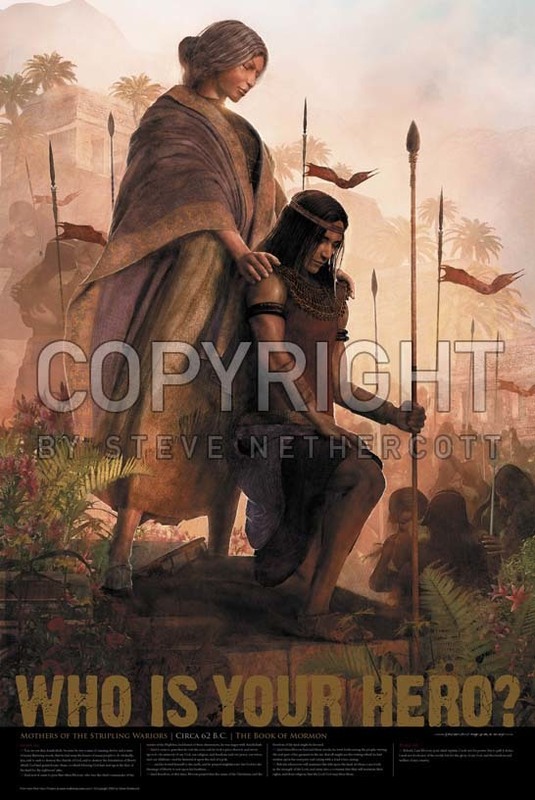 The next painting, HELAMAN LEADS AN ARMY OF 2060 AMMONITE YOUTH is one of the most dramatic in the Book of Mormon. It is misleading that they should be called “stripling soldiers.” They were not little boys, but young men who volunteered to go into battle. They were strong and valiant, marching forth in the strength of the Lord. 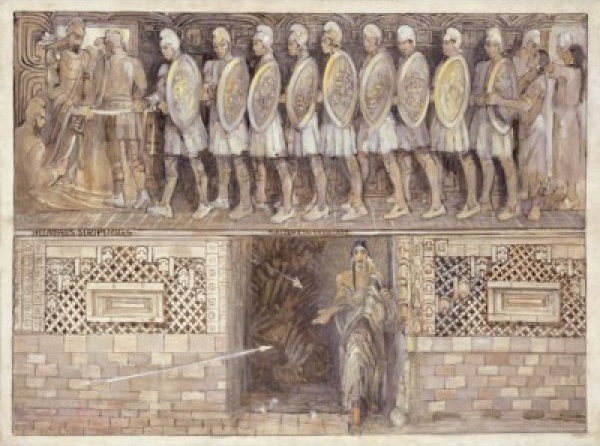 The book speaks at some length of them as men of truth and soberness, “men who were true at all times in whatsoever thing they were entrusted.” Here the artist sought to express their interior testimony of faith through picturing their physical strength. There is in this picture something that skeptics will be quick to pounce upon—the commonly accepted “scientific proof” that there were no horses in ancient America. “Why, everybody knows the Spaniards brought the first horses,” they smartly point out. But no matter what “science” may say, in direct confrontation stands the Book of Mormon, which in several places makes clear mention of horses. Although the Book of Mormon doesn’t expressly say that Helaman rode on horseback, the artist has taken the liberty of showing him mounted. Since the book does speak elsewhere of these animals and since I am somewhat known for my equine paintings, I could not resist including in these 12 pictures at least one horse. 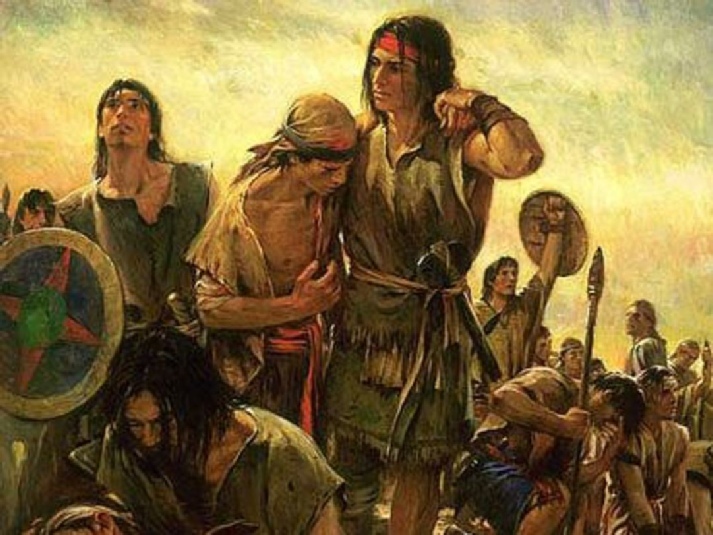 “After receiving a farewell and the shield of faith from their mothers, these young Lamanite men turn in sequence to walk uprightly before God and march in harmony with their fellows. Arches overhead reinforce the sense of their unity. 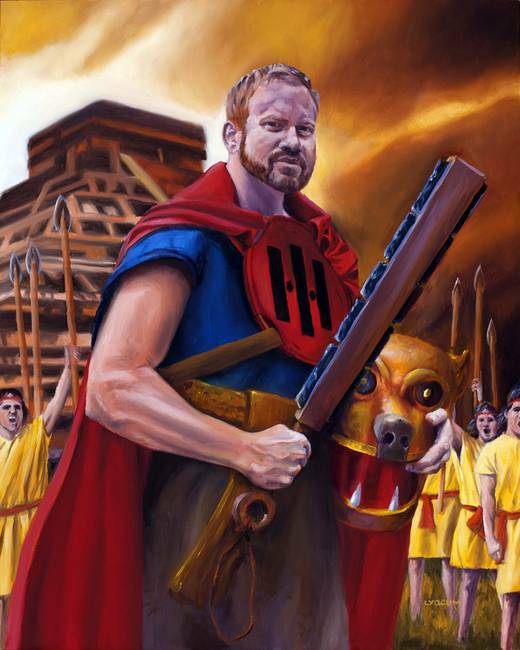 Not having weapons in their own convert families, each is ceremonially armed by the prophet Helaman. The Book of Mormon says they were exceeding valiant for courage and strength and activity, who were true at all times in whatsoever thing they were entrusted. My little band, my sons, my sons, will ye to battle go? Will you fight fiercely for the right against our ruthless foe? What say ye, sons, so young and pure, will you coarse weapons wield? Will you fight bravely at my side, with virtue as your shield? 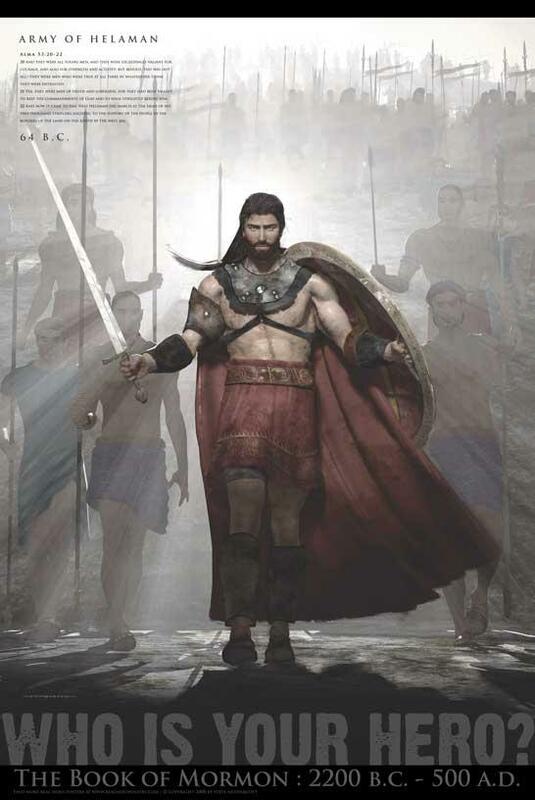 A group of young men determined to fight to defend their country, choosing the prophet Helaman to be their leader. 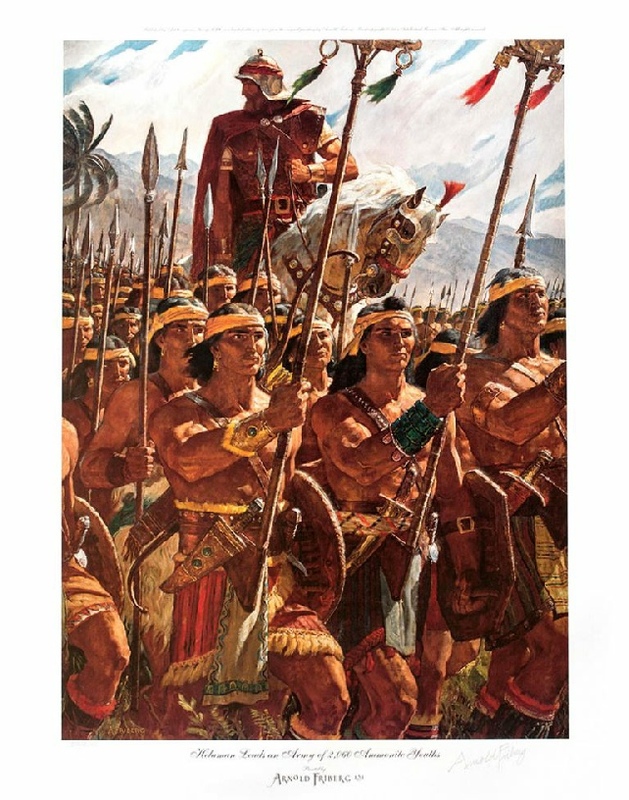 Helaman, a Nephite prophet and warrior, stands in front of some of the 2060 young Lamanite warriors who have rallied to defend their adopted nation. 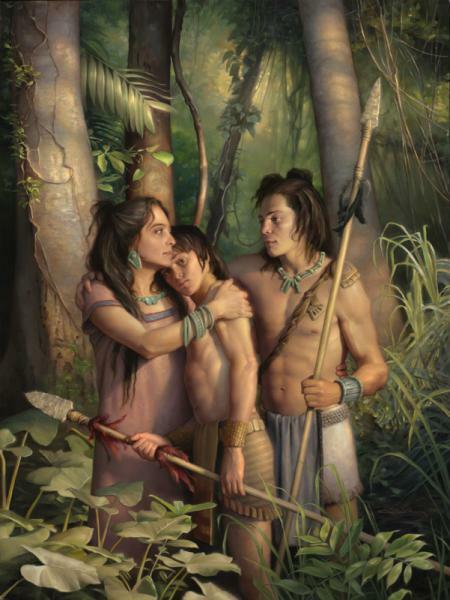 Faithful and exactly obedient in all things, their miraculous preservation through some terrible battles was an inspiration to their fellow warriors as well as to the man who so ably led them, Helaman. Oil on board, 2003. Commissioned.